On December 6, 1969, “The Altamont Speedway Free Festival” was held at the Altamont Speedway in Northern California. The festival made it in the history mostly for the violence that resulted with the death of Meredith Hunter and three accidental deaths: two caused by a hit-and-run car accident and one by drowning in an irrigation canal, number of injured people, numerous stolen cars and extensive property damage. Performers on the festival were Santana, The Flying Burrito Brothers, Jefferson Airplane, Crosby, Stills, Nash & Young and Rolling Stones. The Grateful Dead canceled their performance due to the rising violence. Approximately 300,000 people attended the concert. 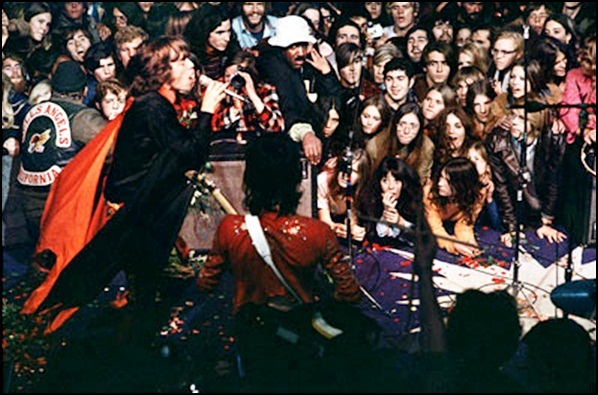 Filmmakers Albert and David Maysles shot footage of the festival which can be seen in the 1970 documentary movie “Gimme Shelter”.